"Project Runway" finalist Chloe Dao. » "Project Runway": Finale airs at 8 p.m. tomorrow on Bravo. What was Chloe thinking when she picked Diana to help her on her final assignment? Will stubborn Santino get his way? A month after New York Fashion Week, fans of Bravo TV's fashion design reality competition "Project Runway" are dying to know which of the three finalists -- Daniel Vosovic, Chloe Dao or Santino Rice -- will walk away with the top prize of $100,000 to start their own fashion line. It's anyone's guess who will win. Golden boy Daniel seemed he could do no wrong beginning midway in the season, when he started winning consistently, five out of 12 design challenges. Chloe and Santino won two apiece. But last week, the little shown of Daniel's collection was just plain dull. Chloe's fittings remain to be seen. And bad boy Santino, prone to talking back to judges and gluing garments together at the last minute, seemed to have created a breathtaking collection befitting a 1930s big-screen siren. New York's fashion press has given viewers no hint or help, having heaped their highest praise on none of the above, but on fourth-place finisher Kara Janx. Unfortunately, in an industry in which "you're either in or you're out," the catch phrase delivered harshly each week by model host Heidi Klum, Kara was already out before critics saw her collection, presented as a red herring. 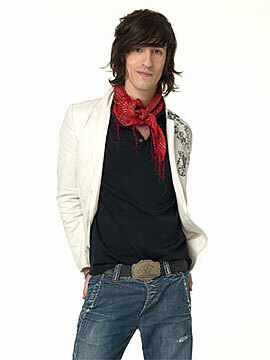 "Project Runway" finalist Daniel Vosovic. Part soap opera and part talent contest, full of colorful characters, beauty industry glamour, a weekly fashion show, a whole lotta dishin' and a cat fight or two, no wonder the program is must-see TV for fashion fans. It's "American Idol" for the style set. "I drop everything and run when 'Project Runway' comes on," said Marcia Morgado, an associate professor in the Apparel, Product Design and Merchandising Department at the University of Hawaii at Manoa. Her students are put through similar paces, though not at the breakneck speed of "Project Runway." Viewers are led to believe the designers must create their garments -- from concept to runway ready -- in just one or two days. Morgado doesn't buy it all. "The time limits are terribly artificial," she said. "It's a little suspect because, like any reality show, we know some of it is staged. Tim Gunn (chairman of the fashion design department at Parsons School of Design, who keeps the designers on task) said they filmed the series in four weeks, plus a couple of days. * If they really take 24 to 28 hours to complete their assignments, it would have been done a lot quicker." But she can't help but watch. "I love the drama of it. Even if the time limits are unrealistic, it replicates the feeling of pressure in getting things done as we do in the industry." AT SASHA DOMINY'S house Wednesday nights, you can find the UH fashion design student and her friends in front of the TV, engrossed in "Project Runway" action. "We're always yelling at the screen, like when Santino got back on and Nick was off, we were like, 'That's so unfair!'" Dominy, a junior designer at UH, said the show "is totally inspiring; at the same time it's totally scary because I try to be realistic in my goals. Before I watched it, I wanted to be a big Vera Wang kind of designer, but I can see how hard it is, how the press can get on you, how it can be so cutthroat. "I kind of feel like Chloe, who questions whether she has the heart for it, because you really have to dedicate your whole life to it. Right now, I don't see myself as a name. I would be content to design for a big-name person, though maybe in a couple of years I could change my answer." The show has already helped Dominy advance toward one of her goals of studying in Florence, Italy, this fall after her mom had a change of heart after watching the series. "She did not want me to become a designer so I never talked to her about anything that I was working on," Dominy said. "Now, she's really interested in what I do and wants to see my designs, and she's been really supportive. She's letting me go abroad to study." A LOVE FOR fashion is not a prerequisite for viewing. Alan Ramos, a Kapiolani Community College student who's more likely to be found watching boxing or lifting weights than matching his jeans and T-shirts, got hooked after catching the end of Episode 5, in which Nicky Hilton was a judge. "Project Runway" finalist Santino Rice. "I'm studying marketing so I thought, I gotta be on top of these things, see what sells. I waited to see if my favorite, Nick's (Verreos) dress, would win." Instead, a dress similar to Nick's won, though Nick's dress was the second favorite in an online viewer poll. "After that, I started watching to see if I could pick the winner, and I did pretty well," said Ramos, one of few straight men man enough to admit watching the show. "My friends, they tease me," he said. "I'm like, 'Agh, they don't understand.'" THE SERIES has changed Ramos' shopping habits. In the past he would frequent only a few stores. "Now I go from store to store to see what's out there. Before, if things didn't fit that well, I just accepted it. I didn't think too much about it, except maybe I need to work out more. "With my classes and all, I can see now how designers cater to certain demographics and they can make shirts in a different way, to be more easy and loose fitting." Kevin Imai, a work-force staffing and development consultant for Hawaiian Electric Co., says he doesn't know what day or time "Project Runway" airs, but watches because his wife does. "What I like about it is that fashion is something totally new to me. Through it I found out that I like more classic looks. With the creative types, I think it's ugly," he said. "I like Daniel's stuff best. I think it's more clean. I hope he wins." KARL NAKAMURA, a jeweler with Iridium Jewelers, tunes in for pure entertainment. "It reminds me of when you take classes and get a critique of your work, only this is worse because it's on TV." Nakamura, who studied photography and design at Honolulu Community College, remembers classmates weren't harsh in their critiques, but certain instructors could be. "You do feel embarrassed, upset, angry, the whole gamut of emotions. "(Criticism's) gotta be devastating and you kind of feel for (the designers), but then, I'm like a back-seat driver; I go, 'Man, that's ugly.'" As for who will win, Nakamura is no longer certain. "I thought Daniel was going to win until the last episode," he said. "I think Santino might pull it off. I just can't wait till it's over because then I can get back to a normal life." Until next season, that is. » Tim Gunn, chairman, Department of Fashion Design, Parsons, reports that "Project Runway" design challenges run one to two days, and filming of the challenges "takes four weeks, plus a couple of days." A story that ran on Page D1 March 7 included a misquote saying that the challenges took four months to film.